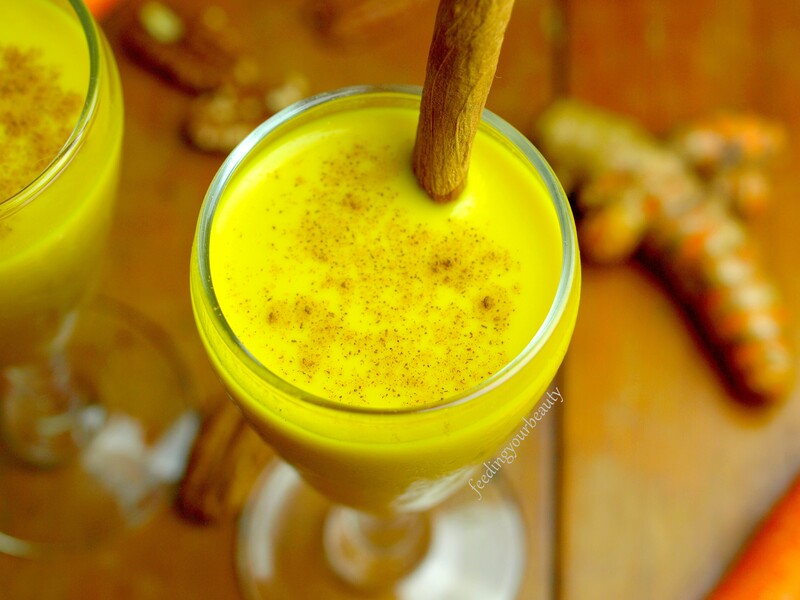 This tasty, health-boosting beverage is a spin-off of the popular “golden milk” and golden latte. It’s a fusion of vitamin rich juice and nourishing plant milk. It’s free of dairy and refined sweeteners, and is just loaded with antioxidants, beneficial nutrients, and immune system boosters. I created this yellow-orange sip to help keep myself and my little one healthy all year long, but especially during cold and flu season. Whenever I feel a cold coming on, I either whip up a hot turmeric latte, or blend up this creamy and flavorful milk, and it always makes me feel a ton better. I either prevent the cold altogether, or if it had already taken a firm hold, it helps me get over it much faster. If it’s a real doozy, I reach for the garlic and load up my easy 10 minute cup of soup. We’ve heard it all before: frequent hand-washing, sleeping enough, and finding ways to handle everyday stress are always your first line of defense. Regularly sipping on beverages like golden milk and today’s amber milk, is like a little added insurance. It’s great way to supply your body with antioxidants, anti-inflammatory compounds, and other magical properties to not only ward off nasty germs, but to keep you feeling and looking your best for years to come. Turmeric: contains curcumin, which has powerful anti-inflammatory compounds and antioxidants. It’s good for your mood, brain, heart, skin, (basically your whole bod and all of it’s systems), for preventing cancer, treating arthritis, and for treating and preventing infections (aka that nasty bug going around the office). Ginger: awesome for yucky feeling tummies, whether it’s indigestion, gas, motion-sickness, and is safe for pregnant women experiencing morning-sickness. Ginger has powerful anti-inflammatory compounds, and studies have shown it dramatically reduces arthritis pain and swelling. Studies have also shown promising anti-cancer effects in ginger. Many people find it helpful in getting over a cold faster, thanks to gingerol, the bioactive compound in ginger that fights infections. Cinnamon: is packed with antioxidants, and studies have shown these polyphenols have strong anti-inflammatory properties (important for preventing all kinds of diseases). It’s been shown to be effective against cancer, diabetes, neurodegenerative diseases (like Parkinson’s), and bacterial and fungal infections. All cinnamon has health benefits, but for regular consumption in larger quantities, Ceylon cinnamon is the best choice. Ceylon cinnamon contains very little coumarin compared to Cassia cinnamon (the cinnamon that most of us use). Coumarin is a toxin that could potentially cause liver damage in large doses. For baking and sprinkling on things here and there, I use regular (Cassia) cinnamon, for making teas, lattes, and wellness “mylks” I use Ceylon cinnamon. Carrots: great source of antioxidants, including (but not limited to) beta-carotene. They help slow down aging, promote healthier skin, and help prevent: cancer, heart disease, tooth decay, macular degeneration, and stroke. Pecans: surprisingly, pecans are another antioxidant powerhouse, and are one of top 15 foods known for their antioxidant activity. Vitamin E, ellagic acid, beta-carotenes, lutein, and zeaxanthin defend your body from harmful free radicals, preventing chronic diseases, cancer, and infection. They are a good source of zinc, which is great for boosting the immune system and speeding up healing. I usually add extra ground turmeric and ginger as well – try adding an extra 1/2 – 1 tsp of each. Directions: Blend on high for a minute or two and then strain through a nut milk bag or fine mesh strainer. Taste and add spices according to taste, blending again if you do. Sometimes I add a bit of nutmeg and cardamom too. Store in the fridge and consume within 2-3 days. Enjoy chilled. This will work with a regular blender, but you may have to grate your raw carrot first. Keep in mind it doesn’t have to get completely smooth since you’ll be straining out the pulp anyway. You can save the pulp to make other things, like crackers, if you are feeling resourceful and would rather not just dump it in the compost. Here’s to staying healthy this fall and winter! What are some of your go-to natural cold and flu remedies?? Thank you very much! You know, it’s a pretty smooth blend, the carrot adds a nice subtle sweetness, the pecans make it creamy, and the spices and roots add some flavor and kick. When I add in nutmeg it sort of reminds me of a certain creamy holiday drink… without the egginess of course! It’s a lot like turmeric milk or golden milk, just with a tiny touch of carrot flavor. You’re welcome! I was a bit skeptical at first at putting turmeric in a beverage, but now I’m pretty addicted 😀 I’d love to know what you think if you give it a try!